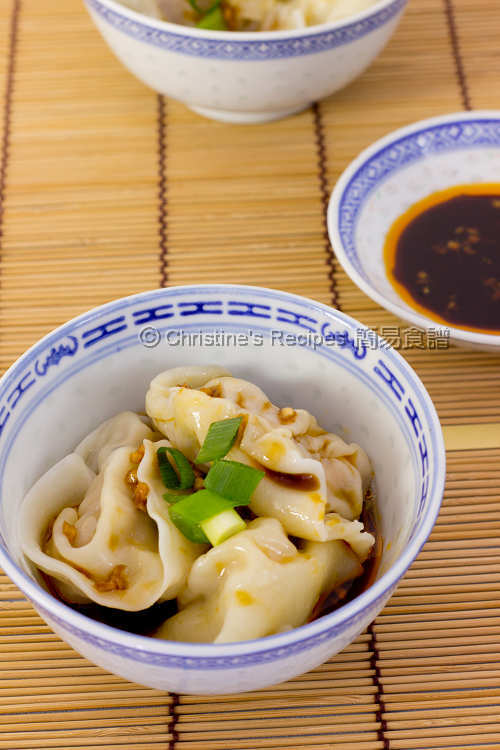 This classic Szechuan dish - boiled dumplings in red oil (紅油抄手) is very easy to make. The silky smooth wonton skin is so adorable. If you’re into something hot, these dumplings are for you. Even though spicy foods are not my most favourite, I’m so intrigued by the red-hue chilli oil in this classic Szechuan dish - boiled dumplings in red oil / chilli oil (紅油抄手). The silky smooth wonton skin is so adorable. You won’t easily feel enough because the well-balanced chilli sauce helps cut through the meat wrapped in dumplings. Mind you that it might get you hooked. 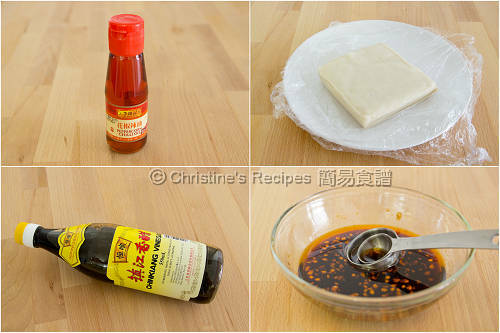 Firstly, get all the ingredients of filling mixed with marinade well, then wrap in wonton wrappers. The wontons are ready to boil. Well, the red oil mentioned in the dish name is chilli oil. You can get it from any Asian grocers. I love the taste of Zhenjiang vinegar, a classic Chinese black vinegar. It balances the taste of the whole dish and its acidity is quite mild, yet enough to help cut through the meat, making you want more. Mix the ingredients of chilli sauce well. Set aside. Rinse prawns and pat dry with kitchen papers. Mix with a pinch of salt and white pepper, then leave it for 15 minutes. Rinse again. (Remark: This step helps make the prawns taste better.) Drain well and wipe dry with kitchen papers. Set aside. Blanch wood ears in boiling water for about 2 to 3 minutes. Drain well and set aside. In a mixing bowl, put in pork mince, prawns, wood ears and marinade. Stir towards one direction and combine well. Carefully lower dumplings in a large pot of boiling water over high heat. Stir the water around in order to avoid the dumplings stick to the bottom. When the dumplings float to the surface, continue to cook for a further half minute. Use a slotted spoon to drain up the dumplings. Transfer them to individual serving bowls. Drizzle chilli sauce and garnish with diced spring onion. Serve immediately. When it comes to making these dumplings, try to get those thin, white dumpling/wonton wrappers, available at Asian grocery stores. It might need some effort to wrap the fillings, yet the texture is very smooth after boiling. 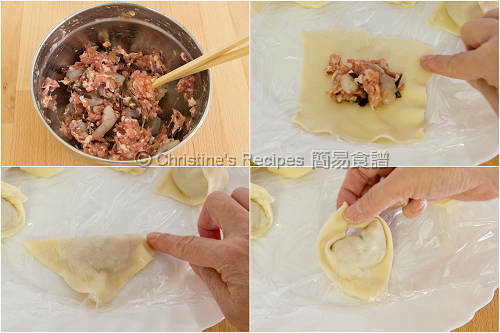 Place a plastic film on the plate for placing your wrapped dumplings. It helps them to avoid from sticking to the plate. The amount of chilli oil can be adjusted to your liking. If you like it very hot, feel free to add more then. If you’re using large wood ears, you can soak it in water until softened. Then blanch it in boiling water. Shred it into thin strips and mix with other ingredients for making fillings. If you don’t have any peppercorn chilli oil, simply use regular chilli oil. Then add a pinch of peppercorn powder in the sauce mixture. These dumplings must be more tasty going with the chilli oil. Got to make this one day. Dumplings.......oooh.....love these, especially with some spice to it. My family loves dumplings. It's quite a while I have not made...too caught up by the Olympics :P I need to make again soon. Thanks for reminding. this looks like the one we had at a local chinese restaurant here. I'm glad I found a recipe for it because I enjoyed it too! These dumplings are so yum! Love the chilli sauce. 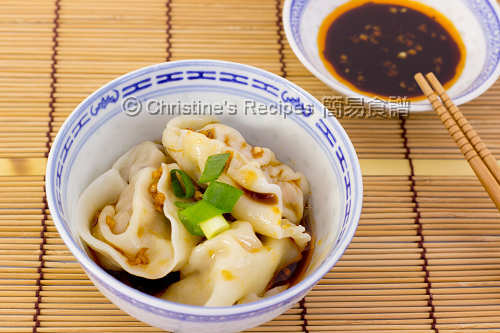 These dumplings look yummy and so neatly done! Hi Christine.. Is there any substitute for Zhenjiang vinegar? When it comes to making this dish, black rice vinegar is often used. Zhenjiang vinegar, a major type of black rice vinegar, is the best. Or you might try other brand or type of black vinegar that comes handy to you.